GREATER GRAND CROSSING — After she was shot on Easter Sunday while coming home from the park, a girl grabbed neighbor Rita Lewis and begged, "'Please don't let me die. I'm only 11 years old. Don't let me die.'" The girl, later identified as Tymisha Washington, was one of five children between the ages of 11 and 15 hospitalized in the shooting Sunday, a tragedy that devastated relatives of the victims and drew an emotional response from Mayor Rahm Emanuel Monday. "They just lit them kids up," Lewis said of the occupants of a car who shot at the children in the 6600 block of South Michigan Ave.
Lewis, 53, was outside because her six grandchildren, including a 3-year-old boy and 11-year-old girl, had just started heading home from the park near Brownell Elementary School when the shooting started. 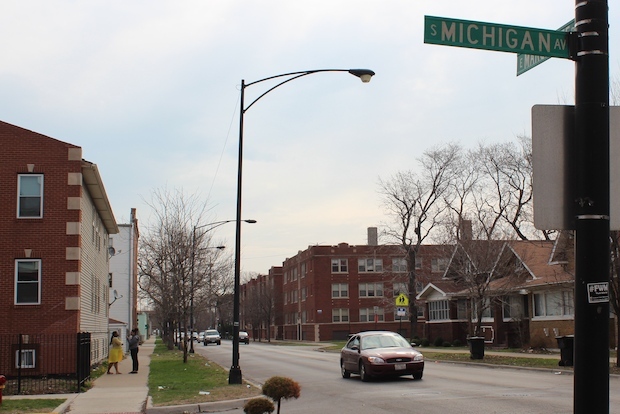 The occupants of a light-colored car approached and fired shots at another group of children who were standing near East Marquette Road and South Michigan Avenue about 7:38 p.m., said Officer Jose Estrada, a Chicago Police Department spokesman. As the shots rang out, Lewis said she ran from her porch and "threw" her 3-year-old and 5-year-old grandchildren onto her porch. The shots struck a group of children walking behind them on the block. The shooters "must've rolled down the window and said something because all the kids started hollering, 'No, no, no!' then you heard, 'Pow, pow, pow, pow'," she said Monday, as she closed her left eye and curled her index finger to simulate pulling a trigger. Police said whoever was in the car asked the children if they had any gang affiliation before firing the shots. The number of shooters and the type of gun used in the shooting was unclear, Estrada said. As Lewis' grandchildren ran into the house, they told her a friend of the family had been shot. Lewis said Tymisha grabbed her as she approached her, screaming in pain as she held on to a fence a few houses down. "'Please don't let me die. I'm only 11 years old. Don't let me die,'" Washington pleaded to her, Lewis recalled. A man handed over his yellow polo, and Lewis used it apply pressure as blood spurted from the girl's wound. Lewis begged the 11-year-old to remain calm as Lewis' hand cramped up from applying pressure to the wound. Lewis said she looked up and saw a 14-year-old girl standing above them in a panic, unaware that she, too, had been shot. A 14-year-old boy lying against a car also had suffered a bullet wound. "'We've got four kids shot here. We need an ambulance, we need police, we need everything,'" Lewis' daughter, Jennifer, recalled pleading with a dispatcher Sunday night. Tymisha was the most seriously injured and taken to Stroger in critical condition, along with a 15-year-old girl in serious condition. The boy was taken to Comer Children's Hospital in serious condition along with the 14-year-old girl, identified as Alice Terry by family. She was in critical condition. Later, a 14-year-old girl walked into St. Bernard Hospital with a graze wound in the buttocks from the same shooting. She was in stable condition, police said. Residents of the block on Monday recounted the devastating drive-by shooting from the night before. Blood stained the sidewalk where the shots rang out. The trail of blood led through a gate to the corner house on the block and ended at its side door. Farther down the block, a large pool of blood could be seen in front of the gate of Jessica Terry's home. Through the black gate, cardboard cutouts of an Easter bunny remained in the grass from a celebration the day before. Jessica Terry, 20, said her cousin Alice, 14, was returning home from the park with the group when they got caught in the crossfire. Terry said none of the victims were residents of the block; her cousin was only visiting for the holiday. "I'm traumatized. My kids are traumatized. She was an innocent bystander caught in the crossfire. It doesn't make sense you can ride up on kids and shoot them for nothing," Terry said. "We need to leave Chicago. ... It's bad." Jennifer Lewis also said she's not sure she'll bring her kids back to the city. "When you have an 11-year-old, and you seen an 11-year-old shot right in front of you, it's the worst feeling in the world," she said, rounding up her children for the trip back to their home in DeKalb. "I broke down in the shower and cried after. Had they stayed out one minute longer they could've been shot," she said of her own children. "My kids are terrified." Her youngest son, Jaden, 3, stood barefoot on the porch Monday, his mouth red from drinking pop. His grandmother had forced him to take off the shirt he was wearing the night before. It had been stained with blood after the shooting. "My tummy hurts," the boy said, poking his index finger into his stomach. "I've been shot." "He's been saying it all night. He's convinced he's been shot," his grandmother said.